The United States Senate on Tuesday will decide which direction to go next with regard to the USA Freedom Act, the supposed surveillance reform bill that already has passed the House and been endorsed by the president. According to its backers, passage of the Freedom Act would ensure that critical counterterrorism tools remain at the disposal of federal investigators but also rein in the National Security Agency’s phone records collection program exposed two years ago by former contractor Edward Snowden. The USA Freedom Act has already passed the House, and a quick passage in the Senate would send the bill to the White House to be quickly signed by President Obama. Notwithstanding bipartisan support, however, lawmakers in the Senate tried to modify the bill further by proposing potential amendments on Tuesday, the likes of which all failed during an afternoon vote. Because the Senate failed to reauthorize the Patriot Act provision that enables the government to run the controversial phone records collection program undertaken by the NSA before a Sunday evening deadline, that aspect of the anti-terrorism law effectively stopped. Should Congress pass the USA Freedom Act, it will formally pull the plug on that phone records program but ensure other counterterrorism stay in place. It would also now compel telephone companies to retain so-called metadata, or call records, in lieu of the NSA. 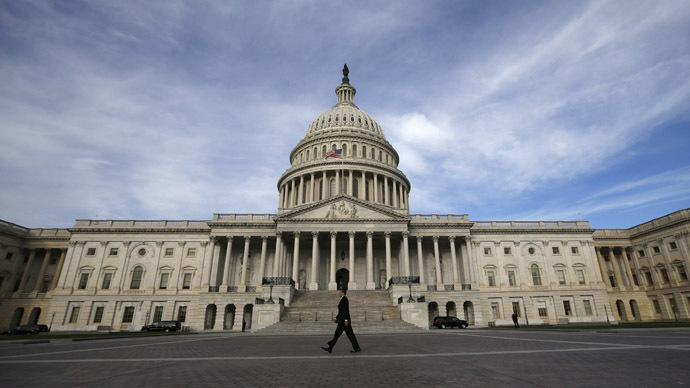 READ MORE: USA Freedom Act vs expired Patriot Act provisions: How do the spy laws differ? McConnell and Sen. Richard Burr (R-North Carolina) backed amendments to the Freedom Act that would have forced telephone companies to hold onto customer call records for a longer period of time and require the Director of National Intelligence to vet any new program in which the call records of Americans are collected for counterterrorism purposes, among other proposals. “Before scrapping an effective system...in favor of an untried one, we should at least work towards securing some modest degree of assurance that the new system can in fact actually work,” McConnell said on Tuesday. Any measures that would have passed the Senate on Tuesday would then have to be sent back to the House for approval there before the bill ends up on the president’s desk. Lawmakers rejected all three proposed amendments from McConnell on Tuesday afternoon, however, paving the way for the Senate to likely soon pass a clean version of the House-passed bill. With Patriot Act provisions having already expired as a result of the Senate’s inability to act ahead of Sunday evening’s deadline, however, the White House said this week that Congress needs to act fast. “The Senate should not get into a game where they start adding amendments to this piece of legislation that then requires House consideration again,” Josh Earnest, the White House press secretary, said Monday.